Any change is difficult to bring about. But tradition needs to be re-evaluated in today’s context. 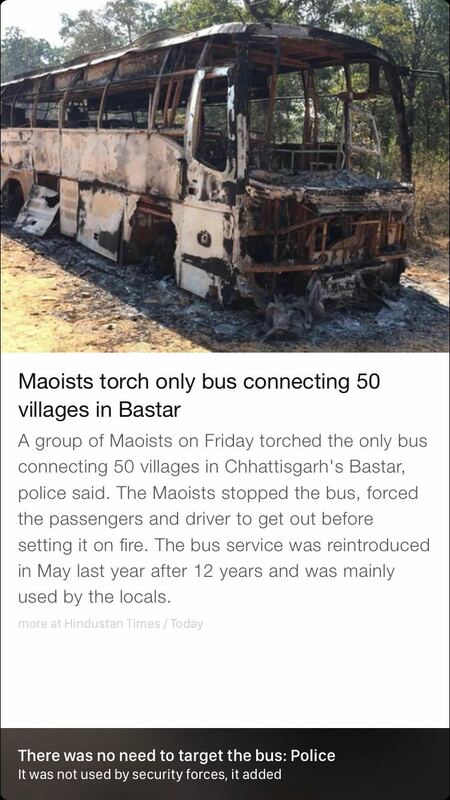 Chattisgarh is a word that seldom crosses my mind, but that is not the case with ‘Maoists’ or ‘Naxals’. If such words occur more frequently in my life, then there must be a perspective that we can’t look away from. Could one of India’s biggest internal security threat have a story that could leave them reasonable for their acts? This book challenged my perspective completely, and by getting into the heart one things, one will realise how one’s preconceived notion can be shattered. Party with a capital P is on a mission and with a perspective. None can re-define or opinionated when you go through the logical reasoning route after you go through the author’s route. He interacts with a person called Vasu who belonged to that Party. Through him, the author goes on interviewing more from the Party and writes about their cause. It all started with disputes over land. The whole left wing extremism began in Naxalbari(hence the term Naxalites). The land-based movements were scattered, and they neither had vision nor direction. The people were deprived of their fundamental rights and lands by corporates and people of power, and eventually, the Party had to intervene. The uprisings were further agitated by the energy of the youth, and here we are. I get this news as I started reading this book. The forest cover in Chhattisgarh is dense. Apart from its role of giving out oxygen to the atmosphere, it also helped add fuel to the Party’s movement. I see a wonderful state that where people would not mind going the extreme-mile to voice out – could either be with a gun or with a book. The Party was originated for the neglected ones; the strategy for its people was simple, use whatever it takes to get heard. For any uprising can happen only when the government does not satisfy their needs. I do not know how the State can further go on with this need to have its people fight for its very own people. At the same time, I also see a movement that gives equal importance to women as well. In fact, the number of women in the Party is almost equal to that of the number of men. This is a true collective fight for their rights. Life for a woman in the Party can never be more difficult than the one she would face at her home, in the so-called “normal” society. Come what may, education in the Party is in full steam. They know that for them to become more efficient, they need education. But at the same time, I also see education as the tool to eradicate such uprising. Their means and methods might be unethical, or even low on morale. Knowing that there is no other way, what more can a concerned person do but to fight. Perhaps that is the nature of conflict – what is a glorious battle for one side is an atrocity on the other. There is always a perspective. India is a nation where views are many and extensive. We should learn such lessons from the state. There would never be a reason to fight had the people in power worked for everyone. Where there is neglect, there is an uprising for equal rights. In this world of ours, we are fighting a battle where all humans are to work as one. We can in no way fight against each other anymore.